The 33rd WestLicht Photographica Auction was held in Vienna last weekend. As the auction opened, Matthias Harsch, Chairman of the Executive Board of Leica Camera AG, and Alexander Sedlak, Managing Director of Leica Camera Austria, surprised everyone present with the latest news: the next auction will take place in June 2019 at the Leitz Park in Wetzlar under the name Leitz Photographica Auction (www.leitz-auction.com), with a new logo and will be organised by the long-established, highly-experienced and successful team from Vienna. In future, under the prestigious, historically renowned name of ‘Leitz’, the entire knowledge and expertise of the globally active and networked company Leica Camera AG will come into play to offer even more bidders from around the globe the chance to buy spectacular collector’s pieces and rarities at exciting auctions. The numerous outstanding results at the extremely successful 33rd auction also reflected the enormous interest in equipment formerly owned and used by famous photographers. For example, after an exciting round of competitive bidding, the auctioneers hammer finally fell with a bid of 156,000 euros for the Leica M-P black paint ‘Gérard Bois’, the highest price paid for any of the more than 500 lots. The camera, which entered the auction at a starting price 80,000 euros, was previously owned by the photojournalist Gérard Bois. Under the name Gérard-Aimé, he was best known for his photographs of the riots and student protest marches in Paris in 1968. Other high bids showed the enormous interest in Leica cameras once owned by famous photographers. For instance, a collector paid a hammer price of 72,000 euros to secure the M2 of US combat photographer Sean Flynn, who went missing in Cambodia in 1970. 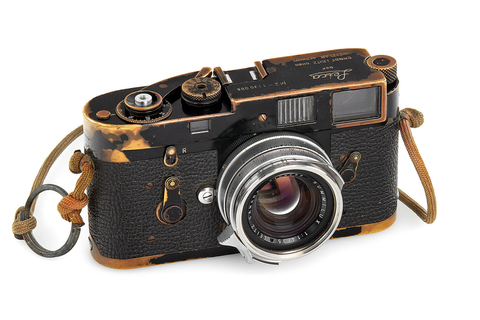 This camera (starting price: 30,000 euros) accompanied the son of the Hollywood legend Errol Flynn in the war zones of Vietnam and Cambodia and the Six-Days War in Israel. Shortly after the auction began, Lot 4, a Leica I Mod. A Anastigmat Export Version, created quite a stir. After only two bids, the starting price rocketed from 30,000 euros to a surprising final hammer price of 120,000 euros. The 33rd auction showed an outstanding sales quota, with 88 per cent of all lots in the auction sold. All prices include the buyers premium.